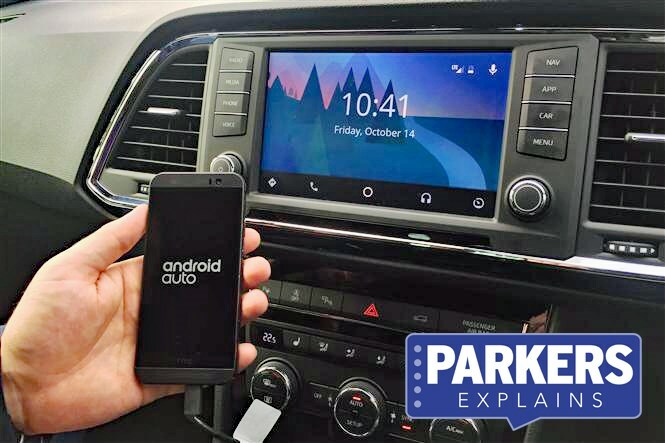 Android Auto allows drivers with Android phones to connect to the car’s infotainment system by effectively mirroring their smartphone and use apps while on the move, just like on their phone. By connecting via a USB cable, the Android interface of your smartphone is mimicked on the car’s infotainment display. To save you needing to use your phone on the move, everything from music and phone calls to sat-nav can be controlled via the touchscreen, steering wheel controls or voice control. It's Android’s answer to Apple CarPlay, with various apps available to make driving easier and safer – for example Google Maps, parking apps and Spotify. Manufacturer-specific apps are also available. It’s worth noting that only approved apps are available that don’t pose a risk to driver safety – you can’t upload pictures to Instagram from your car, for example. It’s not essential. If you love the interface of your Android smartphone, having Android Auto makes using your car’s infotainment system easy and familiar. It’s not universally available – although it’s becoming more popular – so you’ll have to do your research to find out if your next car will definitely have it, either as standard or as an option. Android keeps an updated list of cars where the system is available, including some aftermarket systems, too. Android Auto is available on a variety of new cars, ranging from the Volkswagen Golf and Vauxhall Astra to the Audi Q7 and Ford Edge. It’s worth noting that it’s not always standard, and that you’ll need to select it from the options list for some cars.